🏡 Home Full Workout – Metabolism Boosting, Fat Melter. Super Effective Women’s Workout. 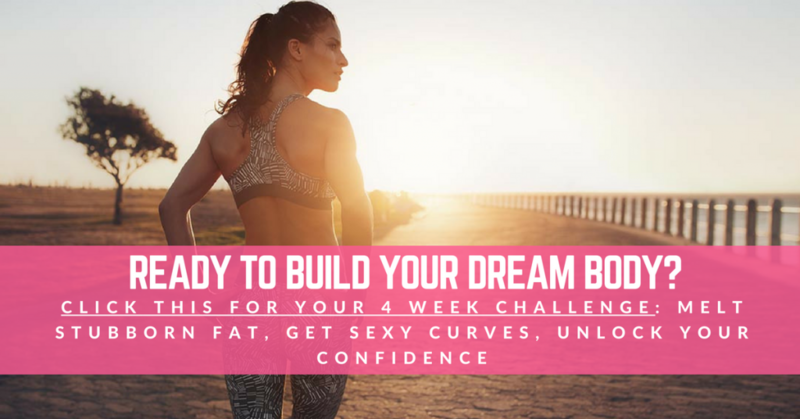 Be sure to look good in that bikini before you buy it cause these exercises can help you walk sexily on the sand! This one can be a killer! This slowly cranks up the stress on your abs and is more difficult to hold than a standard plank. Get into a high plank position. Slowly walk your hands forward, one at a time. Get your hands as far forward as you can without losing your neutral back position. 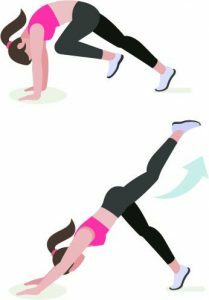 Hold for 2-3 seconds before walking you hands slowly back to the high plank position. This is one rep. While keeping your back straight and your head up, bend only at the waist to the right as far as possible. Breathe in as you bend to the side. Then hold for a second and come back up to the starting position as you exhale. Tip: Keep the rest of the body stationary. Stand with your hands behind your head, and squat down keeping your torso upright and your head up. This will be your starting position. Jump forward several feet, avoiding jumping unnecessarily high. As your feet contact the ground, absorb the impact through your legs, and jump again. Repeat this action 5-10 times. Lie on your side with your hands in front of you and your legs extended on the floor. Keeping your core tensed, raised your legs off the floor. Keep your legs extended and elevated and move them up and down, crossing them over as shown. Each crossover is one rep.
Side raises are great at working the middle section of your shoulders. 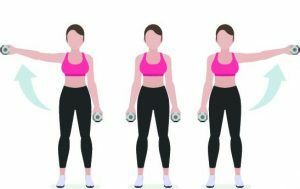 Stand with your feet hip-width apart, holding a dumbbell in each hand by your side. Tense your core and slowly raise one arm up so it is straight out to your side, with your palm facing the floor. Hold for 2-3 seconds. You should be tensing your shoulder as you do this. Slowly lower the dumbbell back to your side. Repeat with the other arm. This is one rep. Try this variation of the donkey kick to increase the difficulty, add resistance for your glutes and work your shoulders. Start on your hands and the balls of your feet, with your legs stretched out behind you and your back slightly rounded. Have your hands directly below your shoulders. 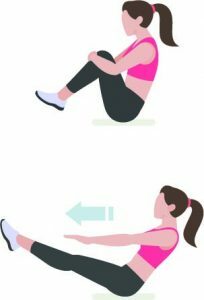 Squeeze your glute, kicking one leg backwards towards the sky with your leg straight, squeezing at the top for 2-3 seconds. At the same time, push with your hands to push your body back with your leg. Slowly return the leg until you’re on the balls of both feet, and pull your arms until your shoulders are over your hands again. This is one rep.
Leg extensions are a great way to hit your lower ab muscles. Sit on the floor or on a bench with your legs extended in front of you. Place your hands out in front of you and slowly lean backwards. Find the balance point where it’s hard to hold your legs out and you’re not falling over. Tense your abs as you pull your legs in towards you. You can hold your knees a little for stability if you need. Push your legs back out again to complete one rep. 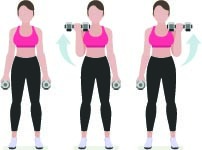 Stand (torso upright) with a dumbbell in each hand held at arms length. The elbows should be close to the torso and the palms of your hand should be facing your thighs. 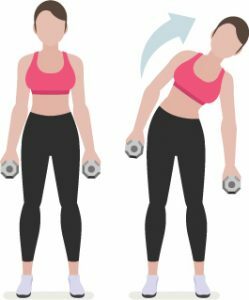 While holding the upper arm stationary, curl the right weight as you rotate the palm of the hands until they are facing forward. At this point continue contracting the biceps as you breathe out until your biceps is fully contracted and the dumbbells are at shoulder level. Hold the contracted position for a second as you squeeze the biceps. Tip: Only the forearms should move. Slowly begin to bring the dumbbell back to the starting position as your breathe in. Tip: Remember to twist the palms back to the starting position (facing your thighs) as you come down. Repeat the movement with the left hand. This equals one repetition. Continue alternating in this manner for the recommended amount of repetitions. A plie foot placement method can be used for a number of different exercises, as it helps to work the different muscles of the calves. The calf muscles have a multitude of movements and as such you should aim to perform calf raises in a both a normal – plie and inverted exercise format. Point your toes out to the side at about 45 degrees, smoothly raise your heels off the ground, holding in the upper phase for 2 – 3 seconds, prior to returning your heels towards the ground. Focus on keeping your foot straight throughout the movement, avoid any twisting movements.